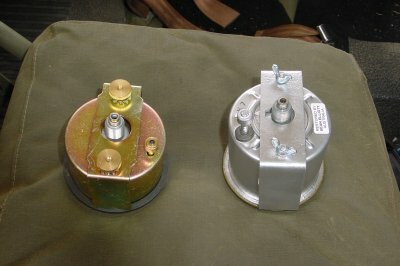 On the left is the reproduction I purchased from Richard Grace. 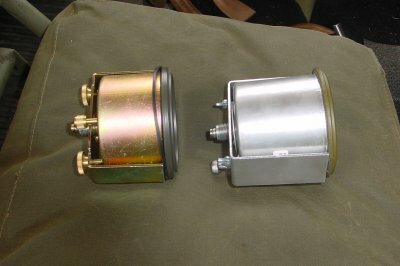 On the right an original WW2 Speedometer. Both have trip odometers. 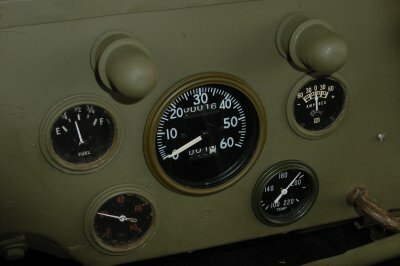 The WW2 Speedometer is courtesy of Sean Elliot of Australia. From the side you can see the differences, still the repro looks good. But I couldn’t believe the condition of the original that had been restored. It looked perfect! A rear shot. I couldn’t get over the finish of the restored gage. Fantastic. Note: that the repro has the trip odometer reset button on the opposite compared to the WW2 gage. Sean initiated a contest where-in you had to tell why your jeep deserved to win. I figured what the heck and submitted the following: Sean that is a mighty nice offer. Frankie started out as a tired old horse requiring major outfitting. It has been a 20 year journey. 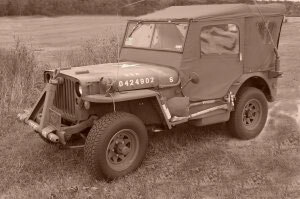 At one point the jeep was pretty close to original or as original as you can make a rebodied jeep. Last year it looked like the above picture after I decided to replace the original brakes with something more substantial. I caught a lot of flak over that decision but for me it was a practical alternative to just letting it sit in my garage gathering dust. One of my proudest moments with the jeep was when it finally said after a nearly 20 year hiatus “Ford” on the back of my jeep. Of interest to me is that word Ford is from an even more ancient jeep then my own. It came from a GP. Frankie looks pretty good and I am proud of it. This year I was able to complete a new refit on the brakes so that I could put original size tires and rims on her. I started with almost nothing and virtually no mechanical or maintenance skills. I have done everything on my jeep with the exception of machine work. 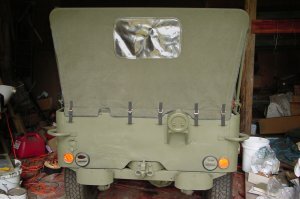 Everything was replaced on my jeep including the frame as it was beyond my capabilities to repair it. Whether right or wrong I have done it all. It generates immense satisfaction for me to drive this old gal down the road. While some tire of hearing me repeat my story, it was also very satisfying to drive the jeep at -45F in Alaska or during a snow storm in North Dakota. That’s living! BTW blowing the doors off some little ol’ granny at the rip roaring speed of 52 mph is a blast! 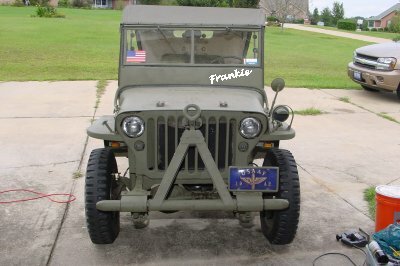 Oh, sure, Frankie or Frankenjeep(tm) as some have put it, has its’ share of faults. One of which is an overdrive which let’s Frankie visit speeds in excess of 45mph without compromising engine integrity (uh, in others she doesn’t blow). About that speedometer. I have been tempted to purchase one of the originals or even one of the repros (long or short needle or is that fat vs. skinny?) 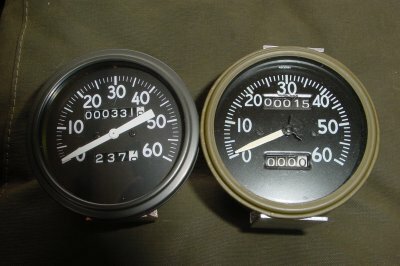 Right now my jeep is honored to have a speedometer that my cousin “found” while in the Army. While I was fighting the Cold War his was a lot hotter in Desert Storm as a tank commander. While I don’t need a “new” speedometer I would be honored to place an original in my jeep. As luck would have, Frankenjeep(tm) won the contest! Sean packaged the speedo up and mailed it to me. I received it on 21 May 2003 and installed it on the same day. I did a quick one mile test drive and it worked perfectly. Thanks Sean! Here the “new” Sean Elliott restored speedometer is installed. The other gages are a mix of reproduction and aftermarket as is fitting for Frankenjeep(tm) (for the time being).